We have room for 1 more if anyone else would like to come on Friday instead of Saturday. 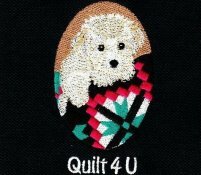 If so, e-mail us at info@quilt4u.com. I will confirm if you are the first e-mail. Everyone other than these 6 individuals, please confirm if you are coming next week as we need to cut kits so everyone will have one available. If anyone wants to stay and make a 2nd clutch, you should have time that day. We will be happy to cut you a 2nd kit for $12.00 that you could work on and/or take home with you. Just let us know so we can have sufficient numbers available. Tandem bicycle tote (make up for this one on August 4thSaturday in the p.m. after embroidery club - we currently have Laura, Jeanne S, Micky L - if anyone else, let us know).